For about a week Rob and I had been discussing the ranch. Out of reach during the week’s storms, we could only wait for a break in the weather and a couple days of drying before heading out to determine damage. In the meantime, we decided it was time to purchase a new ranch vehicle. Having lost one of our ATV’s to engine failure and needing a two seater, it was decision time. After years of debate, we concluded it was time to purchase a Yamaha Rhino. We looked at other side by sides, but the Rhino won the contest and after riding around for a day I’m convinced we made a good choice. The Rhino had plenty of power, good breaks and compression for slowing on hills. We barely had the Rhino out of the trailer when a group of jakes stopped by. The break in the weather was welcome by all. A creek crossing along the way, could have created a real issue, but wisely we loaded the Rhino back into the truck trailer before crossing. The water was deep and would have turned our vehicle from an ATV to an AWV and sunk. That was the biggest obstacle. We checked ponds and roads for a couple hours and were amazed that more damage had not occured. The ponds we checked were full and looking good. Our biggest fear was that the roaring water had wiped out one or more of our culverts or caused a big slide making the road impassible. We were relieved to find the road in good shape. Deer were out in good numbers. About a dozen deer fed on the ridge. 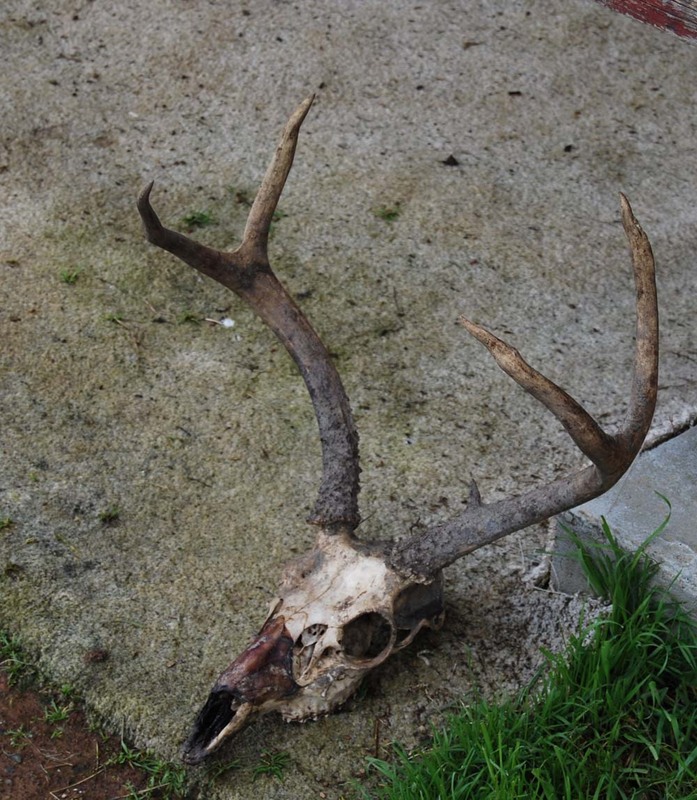 We also found the skull of one more good buck that met up with a lion. Rob found this skull in the canyon. All in all it was a good day at the ranch. Hopefully we’re over the worst weather and we’ll have nothing but spring showers from here on out. 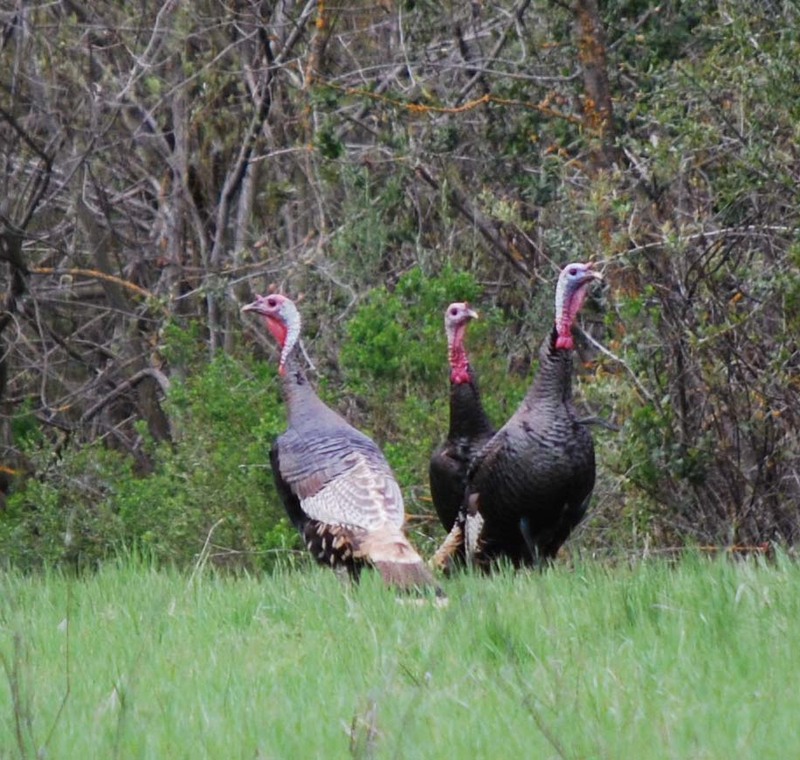 Daugherty Hill WA is one of the top public hunting spots for turkey hunting. The habitat is perfect for turkeys and turkey hunters. Located between Hwy 20 and Brownsville, you need a pass to hunt during the first part of the season, but don’t let that stop you from hunting in the later part of the season. My best guess is I bagged this gobbler around 1990. He came in quickly early in the hunt. 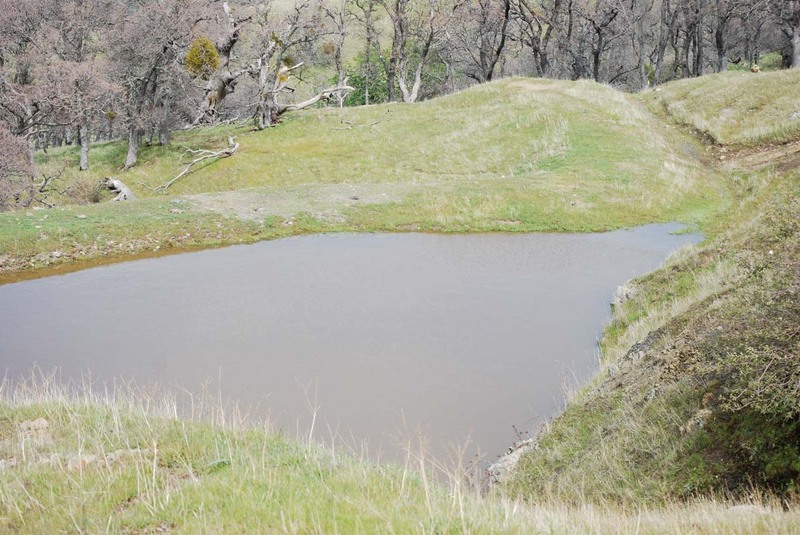 The best hunting is over the hill from the entrance near Dry Creek that runs out of Collins Reservoir. I’ve always found that spring turkey action is best near running water, but not too close. You’ve got to be able to hear. There are two units added since my last hunt at Daugherty Hill, the Darby Unit and the Donovan Hill Unit. Check out the maps at http://www.dfg.ca.gov/lands/wa/region2/daughertyhill.html. This entire area is perfect turkey habitat so I wouldn’t be surprised if a gobbler showed up anywhere on these DFG properties. I’ve always at least heard gobblers on my Daugherty Hill hunts. Granted I haven’t been there for about ten years, so you might want to get some updated info. However, I’ve found that good spots are good spots. I’ve bagged a couple gobblers there. Looking for a Place to Hunt Spring Gobblers? 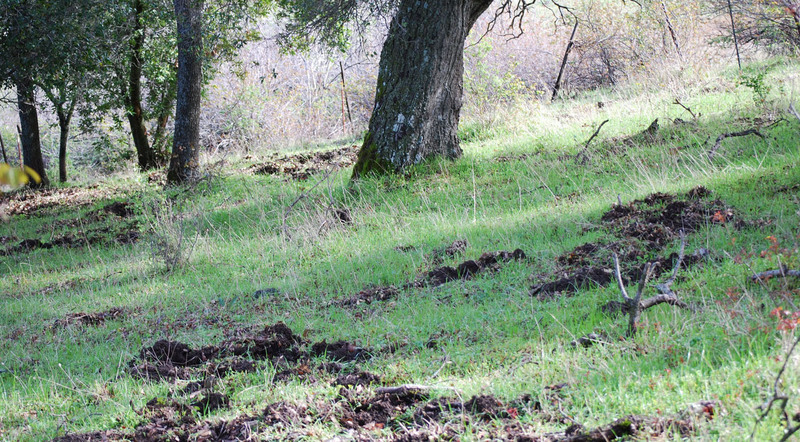 You can hunt one of the many public hunting areas in California. I’ve posted info about several of them on my blog. 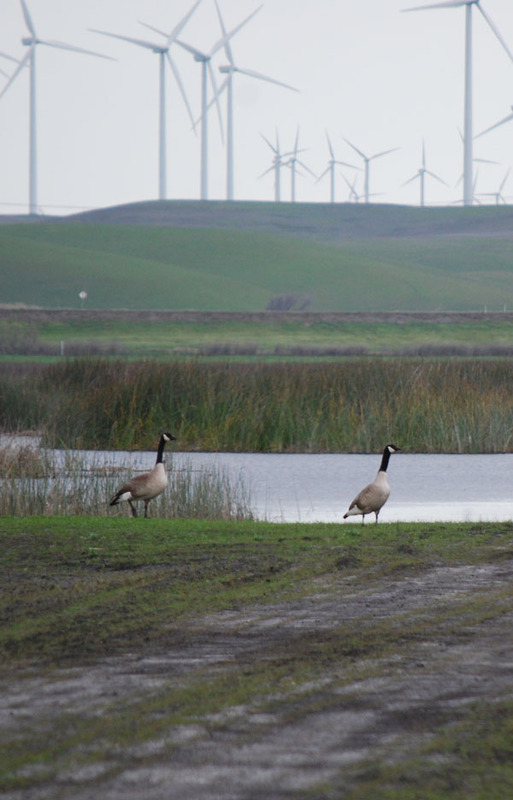 Check the archives for Cache Creek Wildlife Area and Daugherty Hill Wildlife Area. I’ve been on several successful turkey hunts on these state-owned lands. Rob bagged this gobbler at Cache Creek. Not sure what year, but about fifteen years ago. The Wilson Valley is an attractive place to hunt, but a bit of a hike. The first turkey we ever called in was on a Cache Creek hunt, we were shocked and he strutted in to 15 yards from Rob, who never quite drew his bow. Yes we were archery hunting for turkeys before we ever came close to killing one. Finally, we came to our senses and began hunting with shotguns. 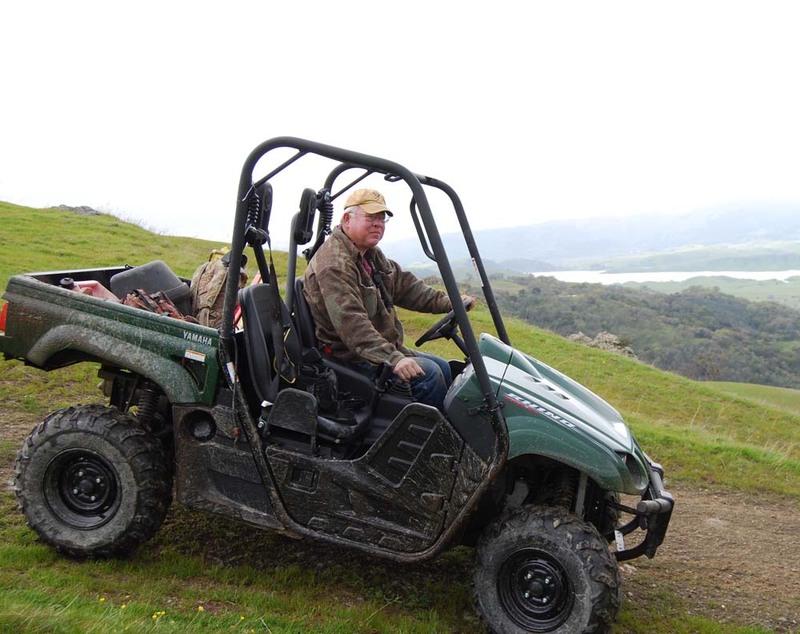 If you’re serious about turkey hunting, you must also check out Fort Hunter-Liggett and Spenceville. I’ve also had success on these public areas. 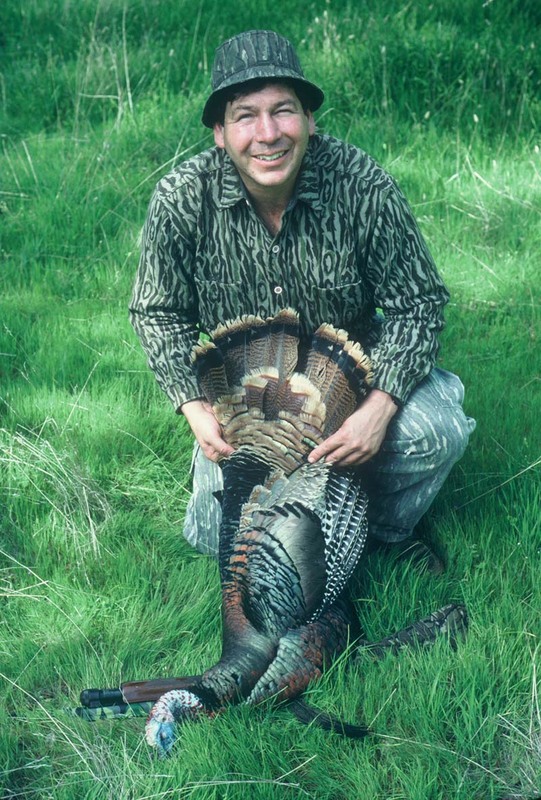 In fact, I believe I bagged the first spring gobbler ever recorded at Fort Hunter-Liggett. I wrote about this a long time ago in California Hunter Magazine. Here’s how it went. 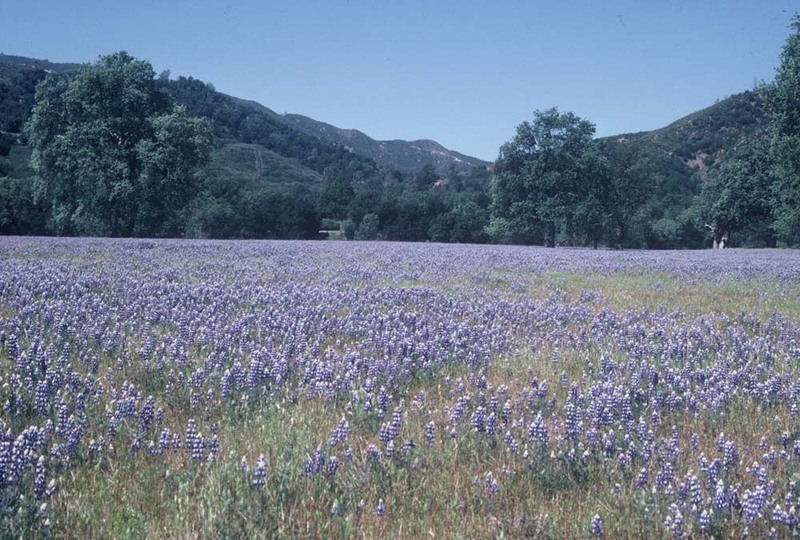 Fort Hunter-Liggett is beautiful in the springtime. Leaving home, I was pessimistic about my chances for turkeys. 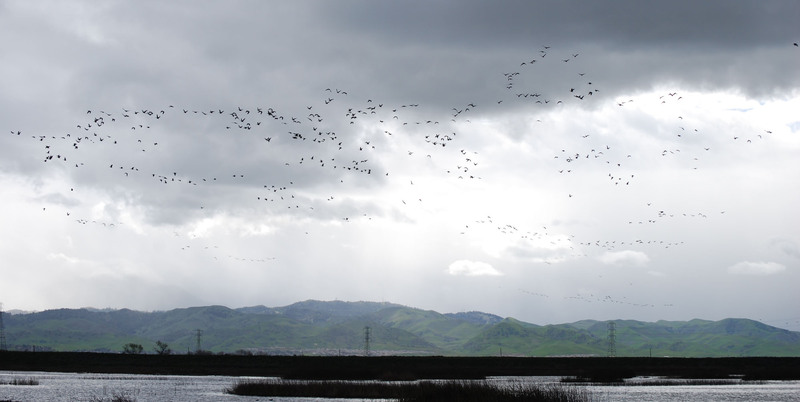 No birds had been killed at Fort Hunter-Liggett during the previous season. 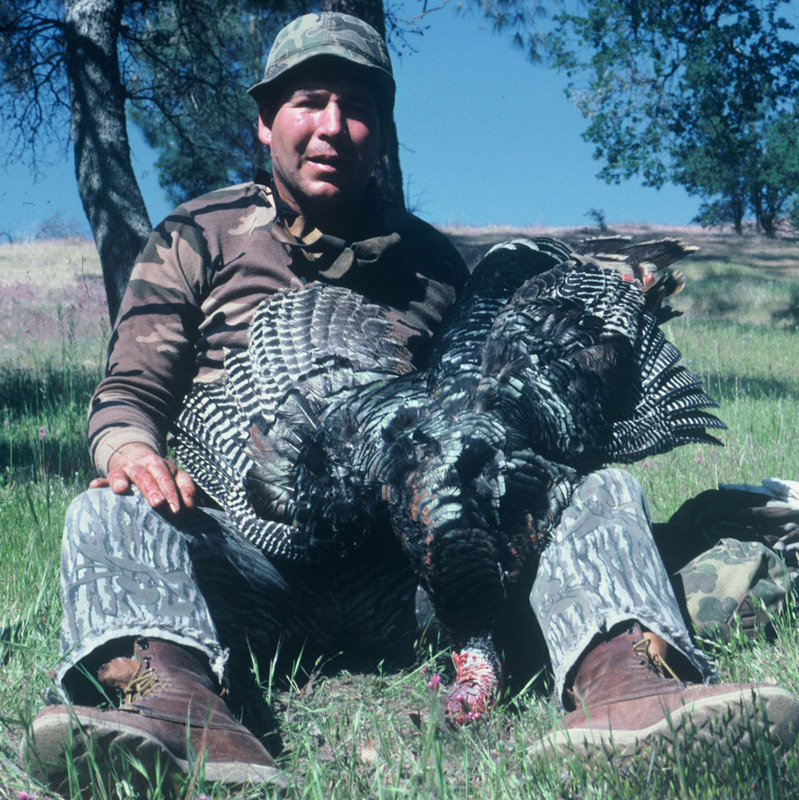 That ment forever as the previous season had been the first turkey season ever at Fort Hunter-Liggett. The report I received was: turkey hunters – 28, kills 0. However, as I left the check station I felt a twinge of optimism. As I drove to the hunting area to look around, the habitat was impressive. There was plenty of good cover and food. 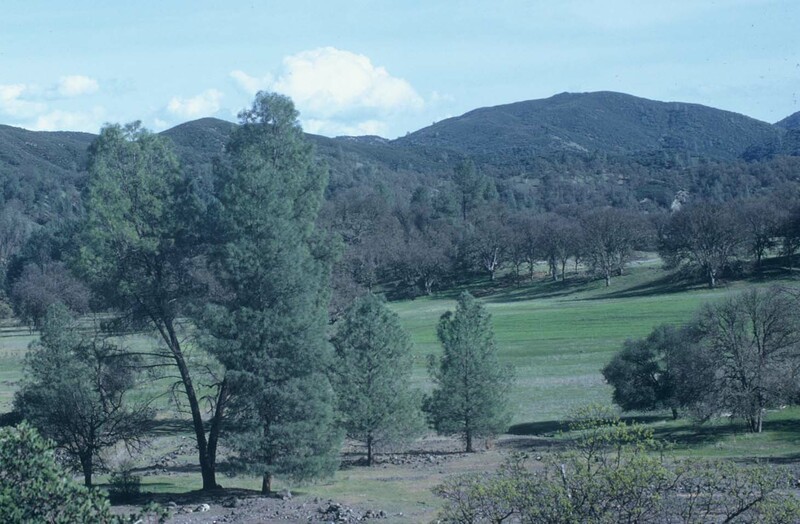 I also knew that Fort Hunter-Liggett harbored large populations of quail, deer, wild pigs, dove and band-tailed pigeons. Why not turkeys as well? It was about 5:30 AM when I climbed a ridge overlooking the center of the area. 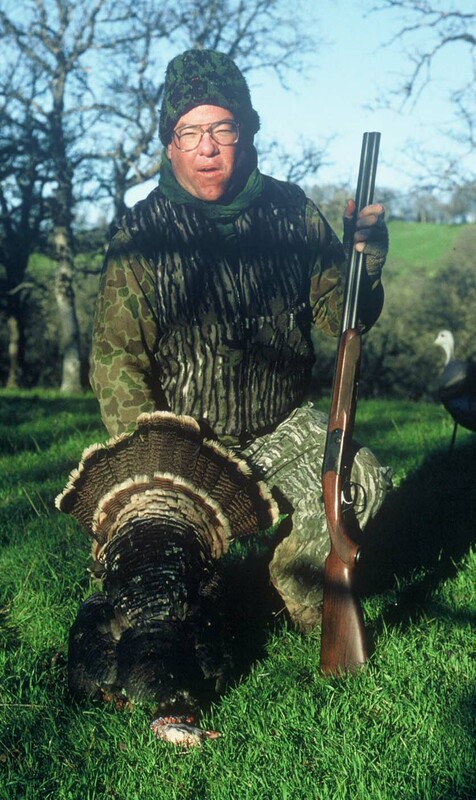 I found turkeys and also two hunters, but after the hunters became disenchanted and left for parts unknown, I decided to pursue the same birds which they had been harassing. Stopping at a nearby flat, I sat down and made a couple of calls with my mouth diaphragm. A gobbler responded from about 300 to 400 yards to the east. I placed my single hen decoy in the open about 20 yards from a brush patch in which I hid. The remainder of the story was textbook. I sat still for only a few minutes before the bird walked in straight towards my decoy. As he stood next to it, completely involved, I fired a load of #5 buffered shot at him from my old Winchester Model 12. I don’t know if I hit him, but he flew skyward as I blasted again and again. On the third shot he fell and landed with a thump, about 35 yards away. 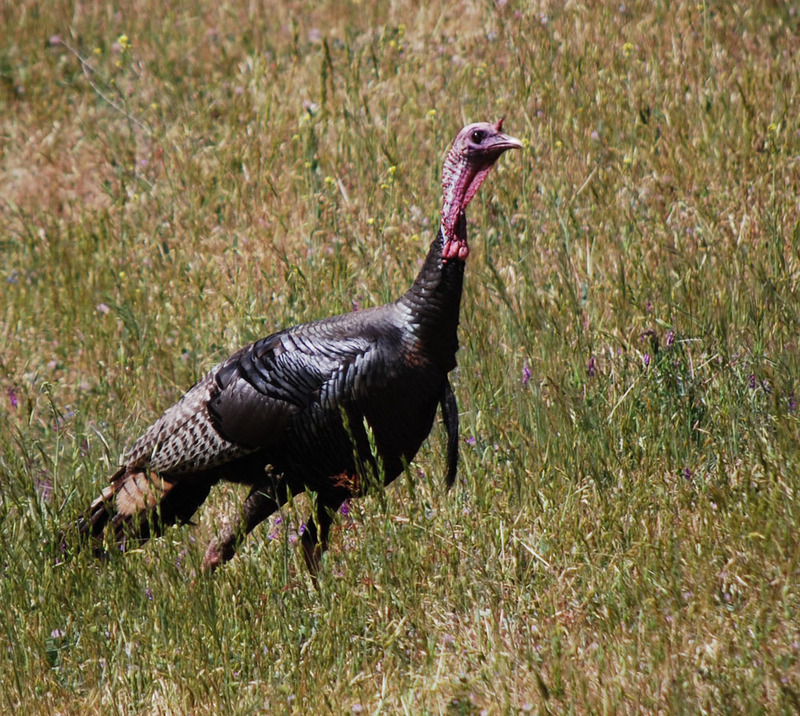 According to the check station attendant, this was the first turkey ever taken at Fort Hunter-Liggett. It is still a prized memory and it involved a great deal of luck. By the way, it was also my first turkey – killed after many unsuccessful hunts. Now if you want to hunt in the East Bay, you can attend the Central Coast Chapter of MDF’s banquet tomorrow night (3-36-2011) in San Jose. 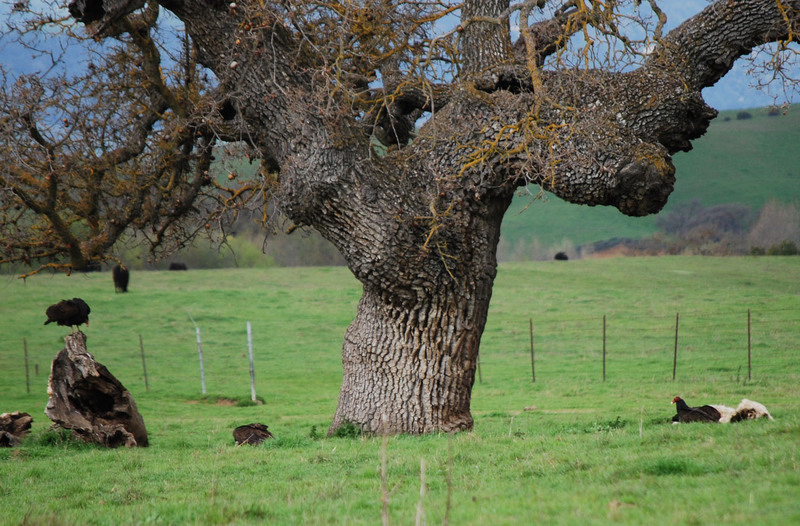 They will be selling a one-day turkey hunt on a private ranch located near Livermore donated/guided by your’s truly. We’ve had pretty good success on that property, but every year is different. 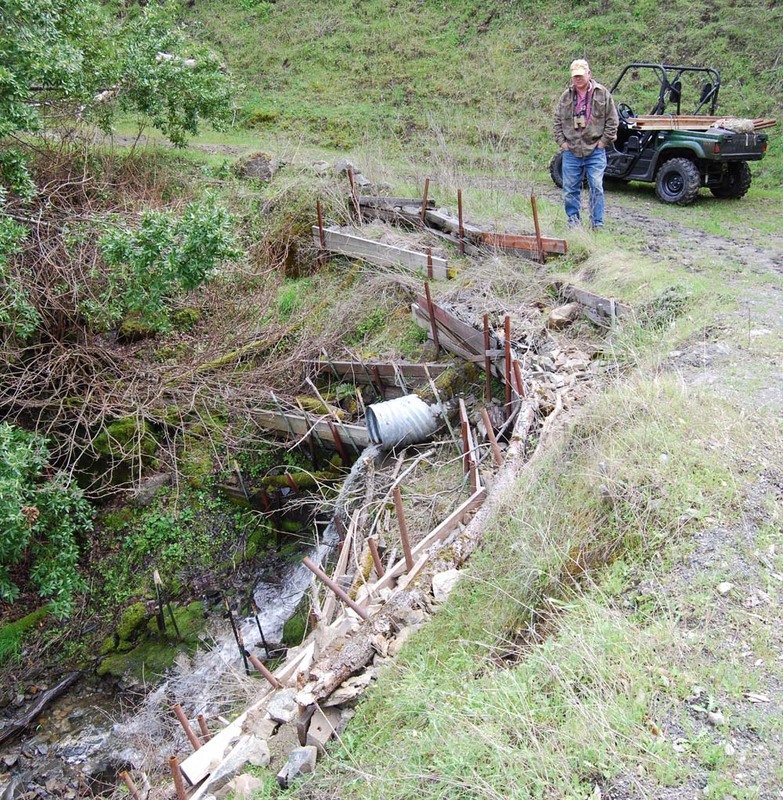 We’re considering doing some significant work on a key spring at the ranch. The project will include installing a new spring box and a couple of modern troughs. Of the two troughs currently in place, one doesn’t work at all and the other won’t last too much longer. This work will insure a longer life for the spring and help spread the grazing more evenly. This trough is working, but we'd like to install a new concrete trough. The project should qualify for matching funds under the Farm Program. We’ll know for sure once the plans have been finalized and approved. The spring currently has no spring box, just gravel and a pipe. The second trough will be installed down the hill a few hundred yards. 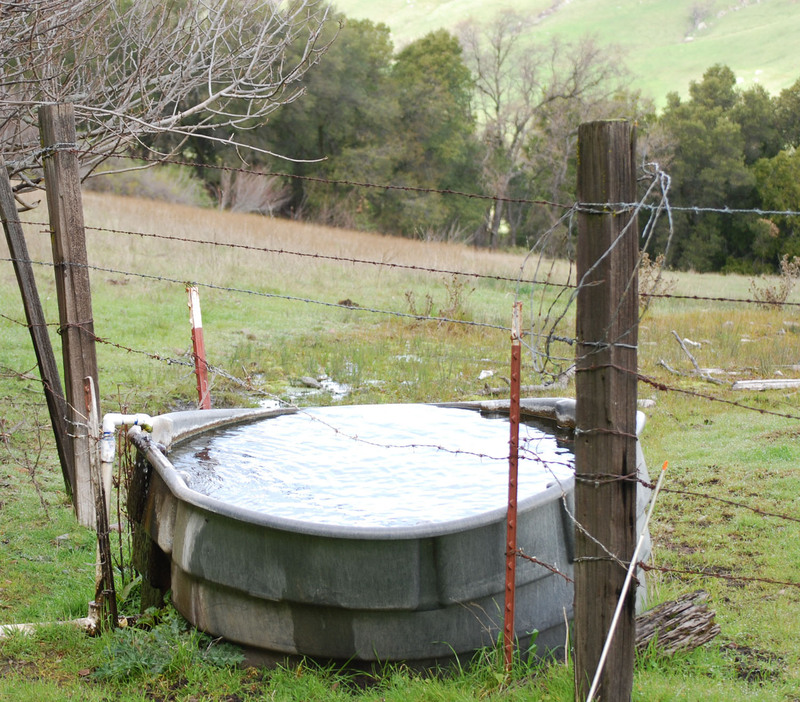 There’s plenty of water to handle two troughs. We may install some type of wildlife drinker as well. We came upon a sow and two juvenile pigs not far from the spring. 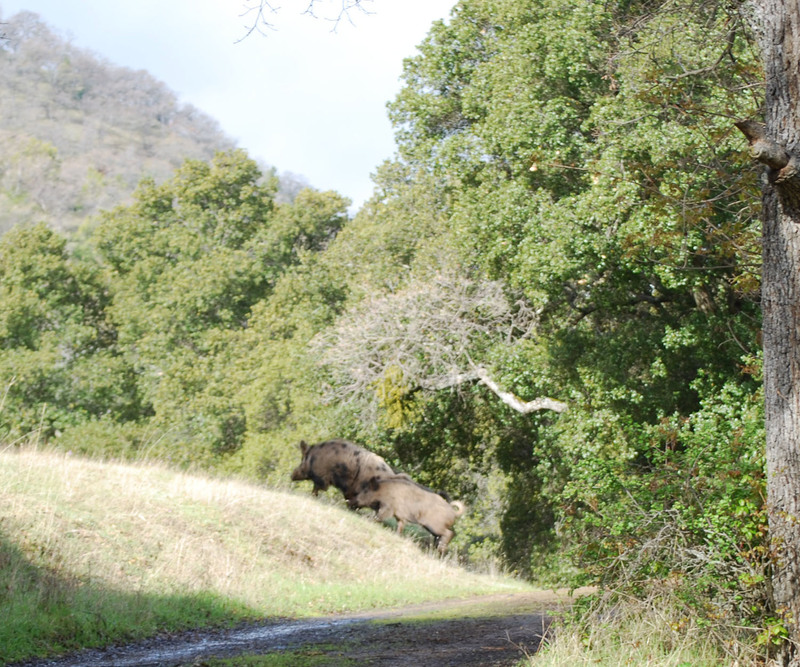 This sow and juvenile has been spotted before. They're living near the spring. Here's where they were rooting when we came along. Although many people call this damage, I’m not sure it amounts to much. Maybe it’s beneficial. Here's a track from the biggest of the three pigs, the sow. My guess is that the sow was pushing 200 pounds. On the way home we saw buzzards cleaning something up. Another Ranch Road victim? Looks like a calf, but I didn’t get out to get a better view. 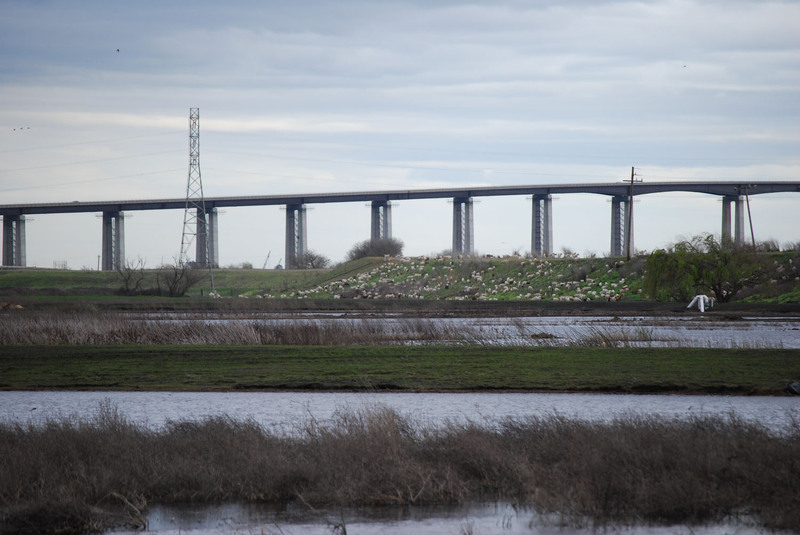 White-front geese near Antioch Bridge. 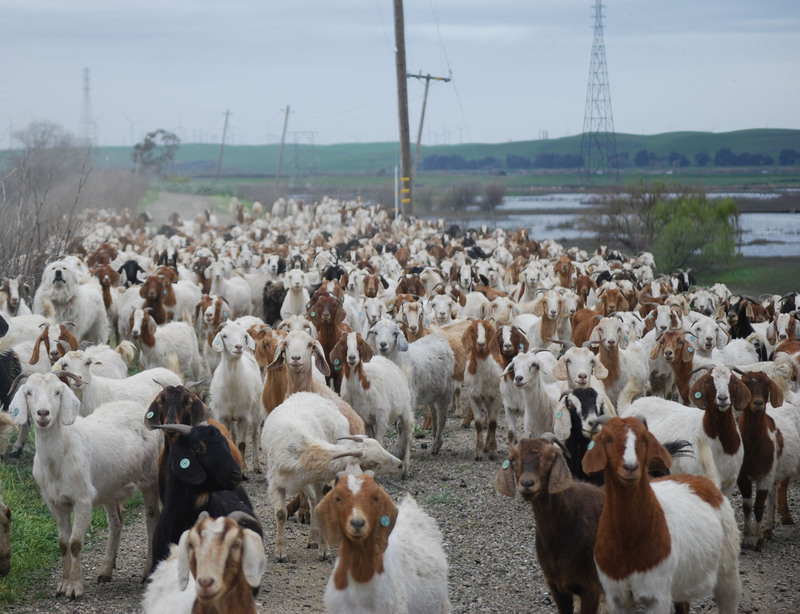 Another common site on the way to Mayberry in late winter is goats grazing on the levees. This levee maintainance is a necessary evil. Maybe the goats are early enough that the cover can recoup in time for pheasant nesting season. 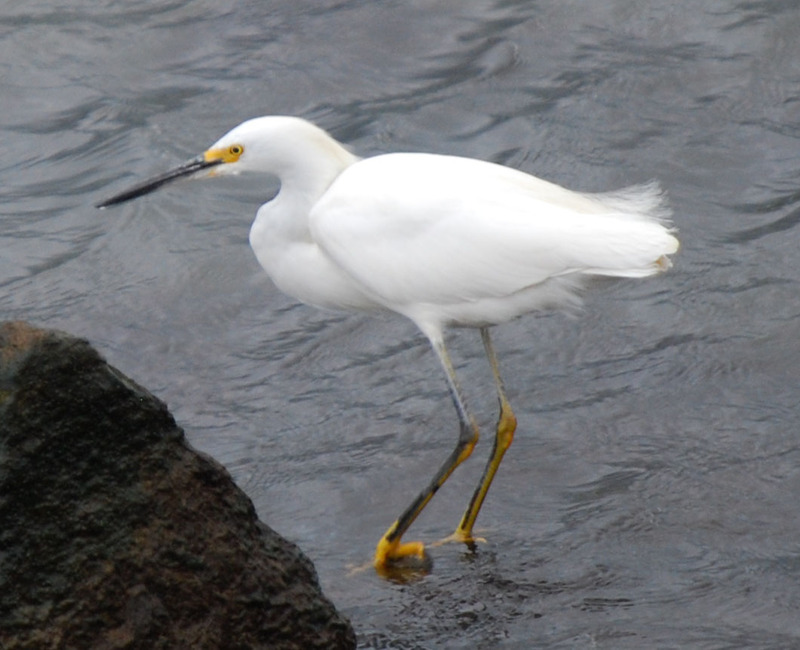 The levee is the only part of the property that has suitable cover for nesting. Here's something new at Mayberry, Canada geese. Maybe they'll hang around to nest, if they can find a bush to hide behind. 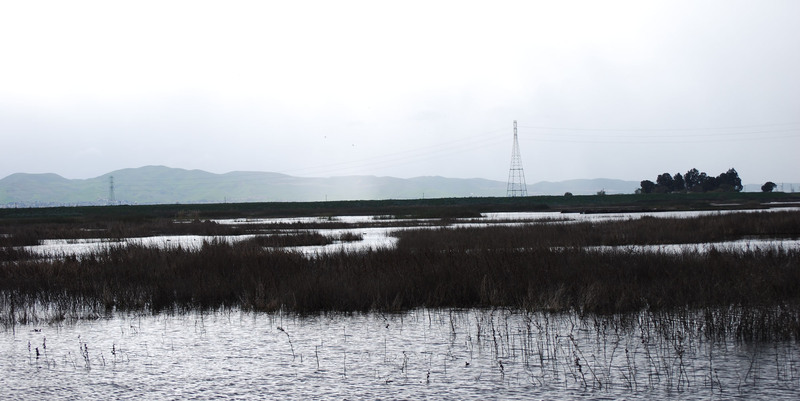 The weather was not good for photography, so I drove around the levees hoping to find something encouraging. A kildeer posed for me. Kildeer are something else that's new. 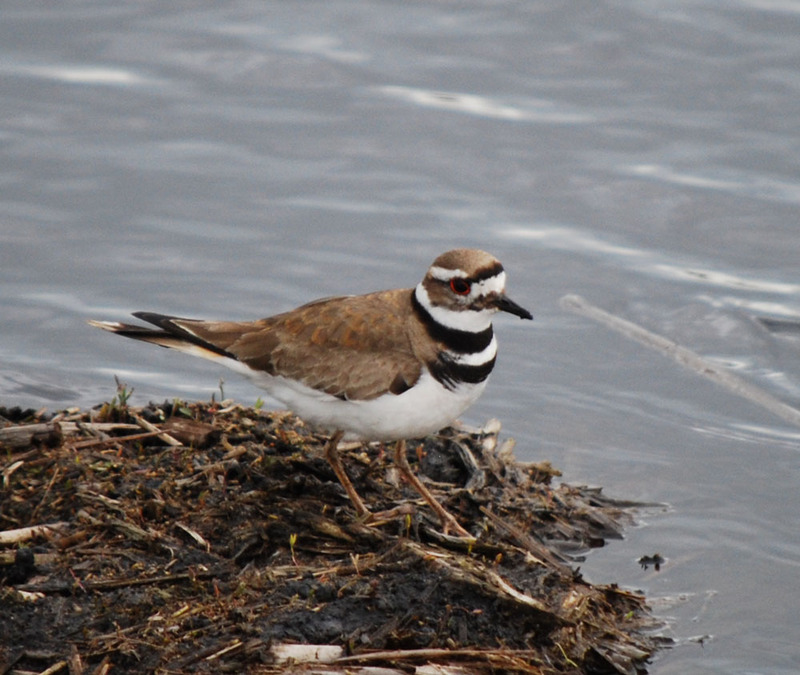 I imagine we’ll have kildeer for a year or two, until the habitat matures. Then they look for another site with no cover. A look at the neighboring pasture, brought back memories of the days when we had seasonal marsh. A look at the Mayberry ponds was discouraging. Mayberry’s ponds held a few ducks in the remaining shallow spots, but most of the ponds were deep and void of waterfowl use. 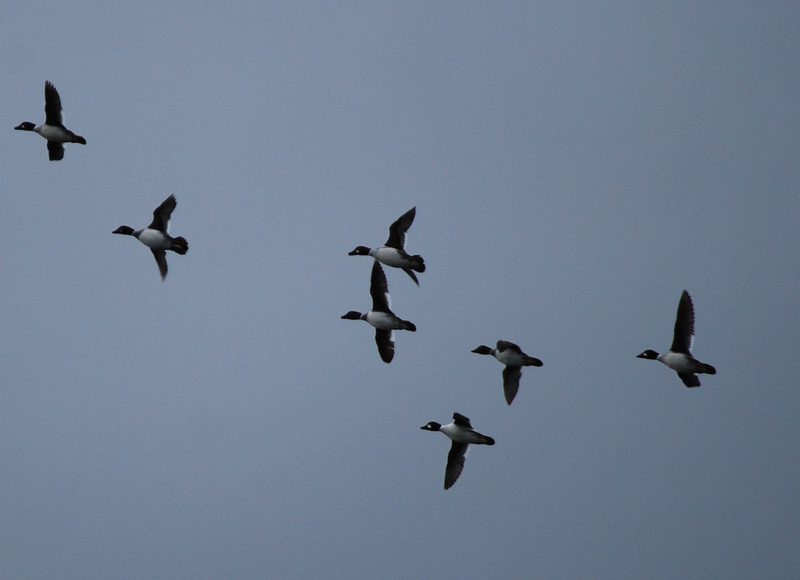 A flock of snows passed by and then a larger flock of white-fronts lifted off to the west and passed overhead. These geese made a lot of noise. The specs came by even closer. Waterfowl was evident all around, but mostly not using Mayberry. A few sprig were using the shallowest portion of the ponds. As the skies lightened, I got a pretty good photo of one passing by. 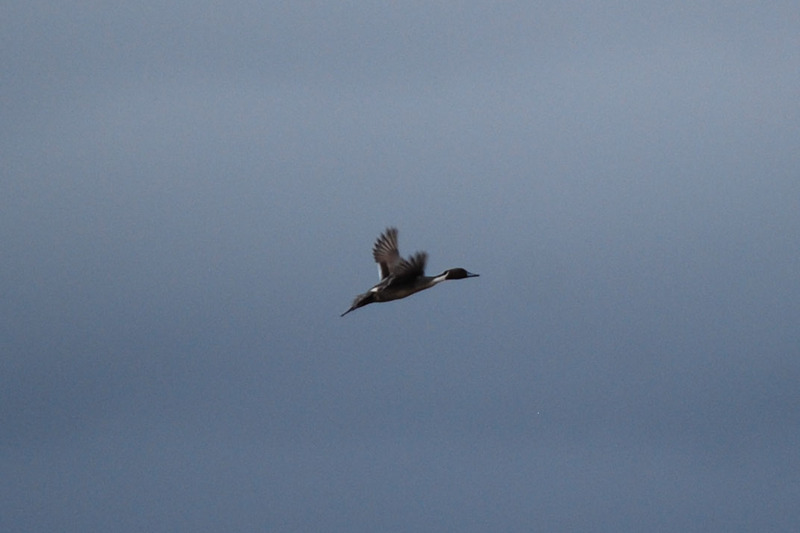 Light conditions were very poor for photography of birds in flight, but the sun did come out to illuminate this pintail. A few attempts to photograph the goldeneyes of Mayberry slough resulted in one pretty good shot. The goldeneye live on the slough, but seldom travel over the ponds. It’s almost time for the goldeneye to depart northward. They’ll be back again next Thanksgiving. Cliff swallows are ever present at Mayberry. 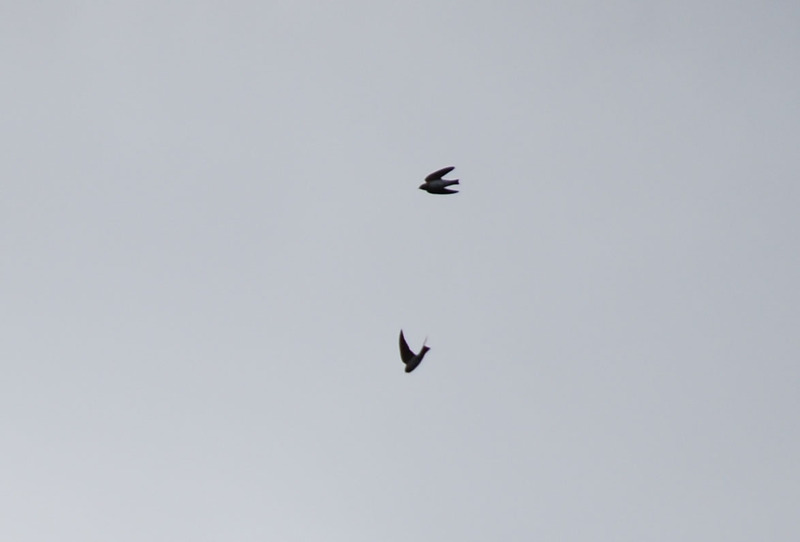 Cliff swallows are tough to photograph in flight. Antioch Bridge view from Mayberry. I suppose the swallows make their nests on the bridge. 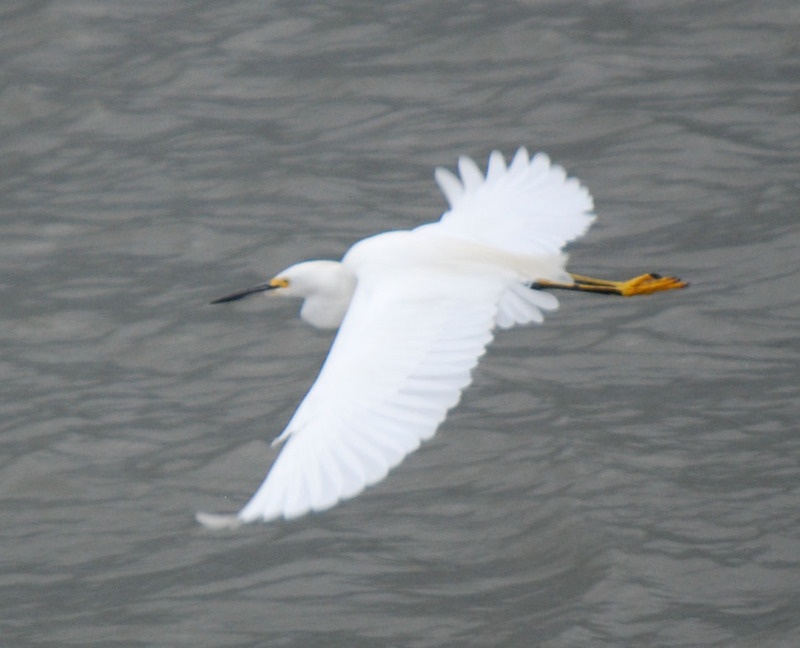 Along the Sacramento River bank, I photographed this snowy egret. He showed well on a gray day. He lifted off and the photo in flight came out pretty well too. Things will improve at Mayberry as the habitat matures. It’s interesting to see how wildlife use changes with the habitat. In March of 1992, The Mule Deer Foundation had approximately 2,500 members. It appeared to be an organization with a good mission, so a group of Livermore conservationists formed a chapter and held a fundraising banquet. You may have been one of the 194 people who attended the first banquet, held at the Springtown Community Center. We were quite proud to raise $14,000 for MDF. Since that time we’ve had seventeen additional banquets, making eighteen in total. This year is our nineteenth and 2012 will make it twenty. In 1992 the mission was “To preserve and protect mule and blacktail deer and their habitat.” Since that time, the mission has evolved. 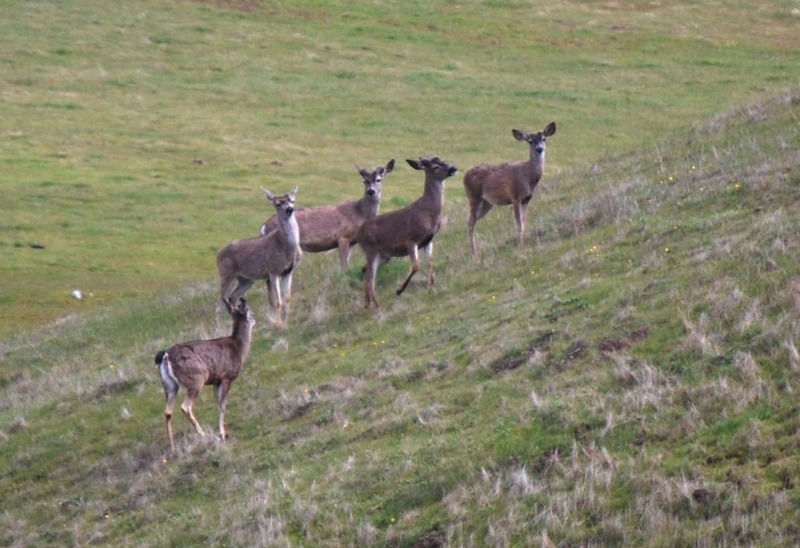 The mission is now stated a little differently; “To ensure the future of mule deer, blacktail deer and their habitat.” The words are slightly different, but the meaning is the same. 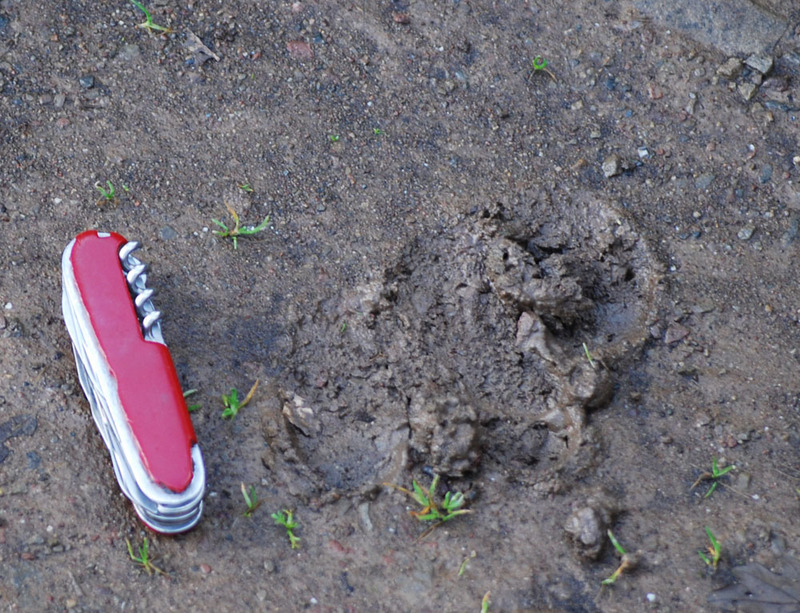 Acknowledge regulated hunting as a viable component of mule and black-tailed deer conservation. Although MDF goals have been in place since inception, they too have evolved as the organization matured. Initially the word hunting was omitted. In about 1997, the MDF board of directors very deliberately added the fifth goal. We are an organization of hunters, and conservation includes hunting as a key component. Goal number three addresses public education. In an effort to education our local youth, the Livermore-Pleasanton Chapter of MDF has held several youth days over the years and many local children have been introduced to conservation and also firearms, an important component of hunting. This year, MDF will begin a new era of youth education and its fair to say that the Livermore-Pleasanton model will be part of the baseline for establishing a program that not only will have many volunteers, but also significant funding from Larry Potterfield of Midway USA. In this year’s program, you will find a .243 youth rifle (donated by Potterfield) and the proceeds from the sale of this rifle will directly benefit MDF’s new youth program. Thanks Larry Potterfield, we appreciate your business. 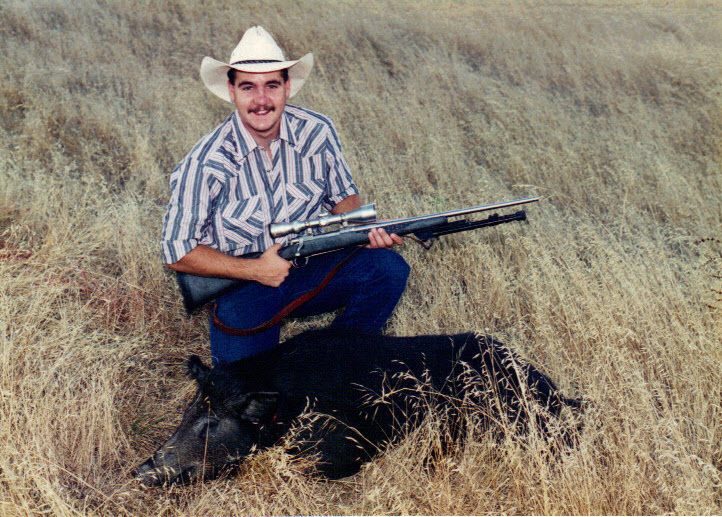 Trophy Chasers has donated a one-person, two-day wild pig hunt to the Livermore-Pleasanton Chapter of MDF banquet on March 10, 2011. Hunting will take place on a portion of Trophy Chaser’s 100,000 acres leased land near King City. Trophy Chasers hunts year round for wild pigs in this area. The donation is for a meat pig, but can be upgraded to a trophy boar for a $200 trophy fee. 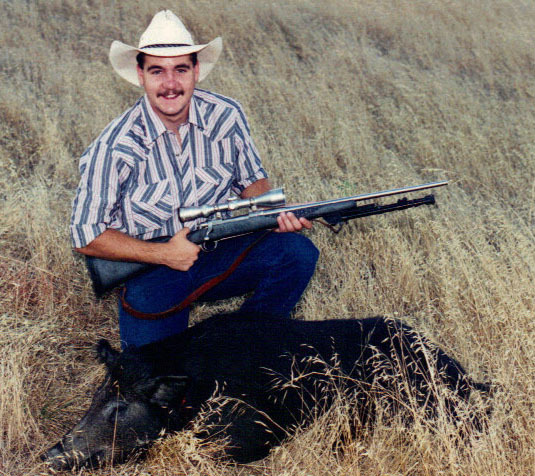 A trophy boar is categorized by tusks greater than two inches from the jaw. The hunt does not include lodging or accomodations.